Introduction: The recent increase in primary bariatric surgery has been coupled with an increase in revisional bariatric surgery. While most revisional surgery is for inadequate weight loss, a small but significant number of malabsorptive complications require re-intervention. The requirement for revision is suggested by symptoms and signs of malabsorption and malnutrition. Multiple investigational studies are often performed in an attempt to determine the anatomy. The utility of such tests is examined. 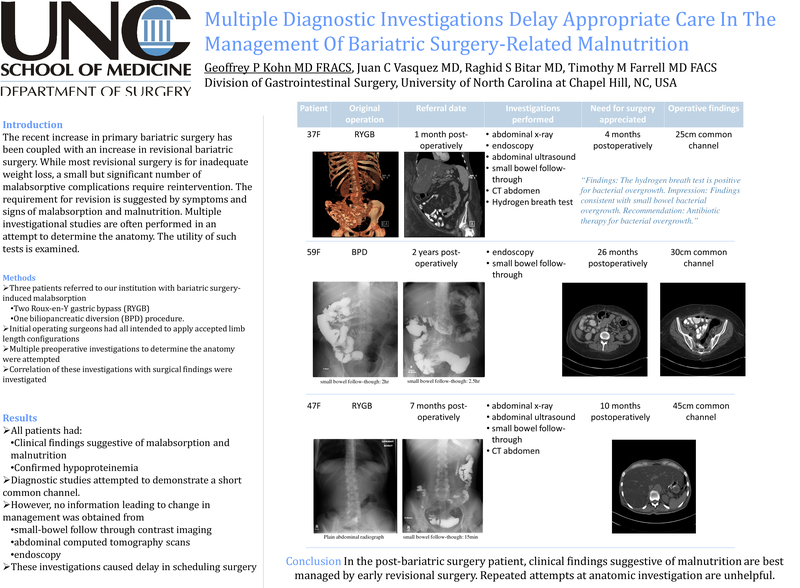 Methods: We describe our series of three patient with bariatric surgery-induced malabsorption who underwent pre-operative workup followed by surgical revision. Two of the patients had previously undergone Roux-en-Y gastric bypass, and one had received a duodenal switch procedure. The initial operative record was reviewed and it was noted that all operating surgeons had intended to apply accepted limb length configurations. Preoperative investigations to determine the anatomy were attempted. Correlation of these investigations with surgical findings were investigated. Results: Clinical findings suggestive of malabsorption and malnutrition were identified in all patients. Biochemical hypoproteinemia was confirmed. Careful review of operative records, as well as multiple diagnostic methods, including small-bowel follow through contrast imaging, abdominal computed tomography scans and endoscopy provided no additional important information. Due to difficulties in identifying the enteroenterostomy anastomosis, the length of the common channel was not able to be determined. Though not helpful, these investigations did cause significant delay in scheduling for revisional surgery, with the time from initial surgery to appreciating the requirement for revisional surgery in all cases being more than 6 months. Conclusion: In the post-bariatric surgery patient, clinical findings suggestive of malnutrition are best managed by early revisional surgery. Repeated attempts at anatomic investigation are unhelpful.